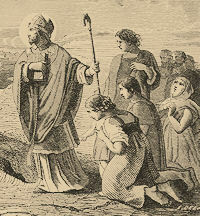 Historically today is the Feast of St. Finbar who lived in the sixth century in Ireland. He was a native of Connaught, and instituted a monastery or school at Lough Eirc, to which such numbers of disciples flocked, that it changed a desert into a large city. This was the origin of the city of Cork, which was built chiefly upon stakes, in marshy little islands formed by the river Lea. His baptismal name was Lochan; the surname Finbarr, or Barr the White, was given to him after. He was Bishop of Cork seventeen years, and died in the midst of his friends at Cloyne, fifteen miles from Cork. His body was buried in his own cathedral at Cork, and his relics, some years after, were put in a silver shrine, and kept there, this great church bearing his name to this day. St. Finbarr's cave or hermitage was shown in a monastery which seems to have been begun by our Saint, and stood to the west of Cork. 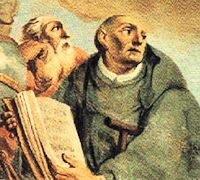 It is also the feast day of Blessed Herman the Cripple (also known as Hermannus Contractus, or Herman of Reichenau, 1013-1054), monk, 11th century scholar, composer, musical theorist, mathematician, and astronomer. Blessed Herman composed the Marian prayers Alma Redemptoris Mater, and the Salve Regina (also known as the “Hail Holy Queen”) which we pray each time we pray the Holy Rosary. Despite significant physical limitations and suffering, the bright and contemplative mind of Blessed Herman advanced not only our understanding of the physical world, but furthered our devotion to Our Blessed Mother. His contributions to both science and faith remind us that regardless of appearance or apparent physical abilities, we each possess immense God-given gifts and talents! He was called "The Wonder of His Age." The patron saint of Cork, was born in Achaid Duborcon near Crookstown, Co. Cork, the son of a Connacht father, a metalworker, who moved to Munster to find work and married a slave girl. Finbarr left home with three unidentified ascetics and spent much time in Scotland before establishing various hermitages in his native area, notably at Kilclooney and on an island in Gougane Barra, which bears his name. Among many wondrous tales associated with him is, one in which he is led by an angel from the source of the river Lee at Gougane Barra to its marshy mouth, where he founded his most important monastery, out of which grew the see and the city of Cork. Another of Finbarr's great legends was the chase and expulsion of the great lake serpent from the lake in Gougane, which created the channel that is now the river Lee. Finbarr died at Cloyne in 633 ad and his remains were taken to Cork to be enclosed in a silver shrine. A pattern is made to Gougane Barra on the Sunday nearest to the feast of St Finbarr which falls on the 25th of September. Herman was born into royalty, the son of a duke of Altshausen. From birth, it was apparent that he would be horribly crippled and disfigured, earning him the less-than-pleasant name of “Hermannus Contractus” (or “Herman the Twisted”). Sources suggest he was born with a cleft palate, cerebral palsy and spina bifida. Without assistance, he could not move, and could barely speak, but within his body was a keen mind and iron will. At the age of seven, Herman’s parents left him at the Benedictine monastery of Reichenau, where they arranged for him to be raised and educated. Situated on the shores of Lake Constance, it was expected that this location would be ideal for Herman’s health, but also for his developing intellect. Abbot Berno, the monk who led the community, took Herman under his wing, educating him with kindness and compassion. Despite his obvious intellect, Herman struggled to read and write at first, his physical limitations difficult to overcome. Once he mastered the basics, the academic world opened to him, and he impressed all with the breadth and depth of his subsequent studies. Not only did he immerse himself in the sciences, but also in languages, music and theology. Herman became fluent in Latin, Greek, and Arabic. He wrote extensively on mathematical and astronomical topics, as well as volumes on the history of the world. He was professed a monk at the age of 30, and continued to write, producing works of great spiritual depth. Of note, his treatise “On the Eight Principal Vices,” which he wrote in a poetic style. More than his writings, however, Herman was known for his gentleness, joy, and sweet disposition. Never was he heard to complain, despite the fact that most activities were painful and difficult. Rather, he was recognized to have a smile for all, and became a beacon of hope and joy throughout the monastery. Students traveled great distances to study with him, learning not only their academic subjects but also strength of character, perseverance, and humility through his model. Blessed Herman’s contributions to academics were great, as were his contributions to sacred tradition. He wrote many hymns which continue to be sung today, as well as portions of the Mass. His greatest contributions may be his hymns of devotion and love for Our Blessed Mother: Alma Redemptoris Mater and Salve Regina. The confidence and hope we place in Mary is eloquently and simply captured in his writings. Blessed Herman died at the young age of 40, having succumbed to the symptoms of his many afflictions. He was beatified in 1863. He was a man who took joy in his struggles, and looked at each difficult day as an opportunity to grow closer to the Lord. Every time we pray the Holy Rosary, we end in prayer with Blessed Herman. The Salve Regina (Hail Holy Queen) reminds us of our deep connection not only to Our Blessed Mother, but to all those who suffer alongside us in the world.